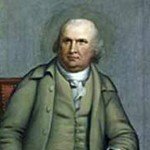 Robert Morris (1734-1806) was a Pennsylvanian merchant and politician, best known for overseeing the financing of the American Revolution. Morris was born in Liverpool, England, the son of a colonial agent. He emigrated to Maryland in 1747, aged 13, and was sent for training in commerce and banking. By his mid-20s, Morris was the part-owner of a lucrative company which, among other things, profited extensively from the slave trade during the French and Indian War. Morris became a vocal opponent of the Stamp Act in 1765, leading a Philadelphia committee that condemned it as unconstitutional. Though not interested in public life before, the unfolding revolution prompted Morris to accept seats in the Pennsylvanian legislature and the second Continental Congress. In 1775 Morris oversaw the secret importation of French war supplies and dealt with much of the Congress’ financial concerns. 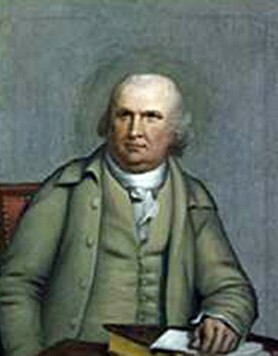 Morris was against the proposed separation from Britain, though once the Congress adopted the Declaration of Independence he readily signed it. In June 1781 the Congress, which was on the verge of bankruptcy, appointed Morris Superintendent of Finances. This role gave him extensive powers to reorganise the national economy and fund the war effort. Among Morris’ reforms were the formation of a national bank, improved recording keeping and accounting and larger requisitions from the states. Morris also contributed most of his own personal fortune to the war effort. Perhaps his most notable contribution was millions of dollars in funding to supply the Continental Army at the battle of Yorktown. After the war, Morris returned to state politics and attended the Philadelphia convention (1787). He later declined George Washington’s invitation to become the first Secretary of the Treasury, instead opting to represent his native Pennsylvania in the United States Senate. In the 1790s Morris bought up enormous tracts of land in the western territory, a gamble that ended with his bankruptcy and imprisonment (1798-1801). Once the wealthiest man in America and the ‘financier of the American Revolution’, Morris spent the last years of his life in retirement and seclusion.